Get news & members-only deals. 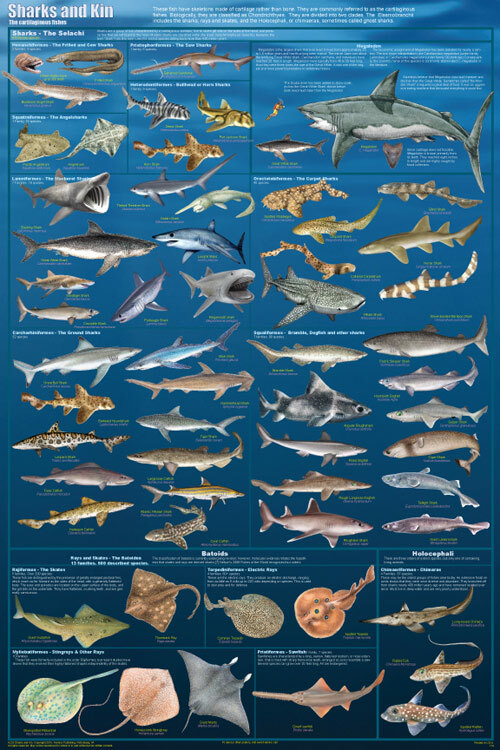 There are over 470 species of sharks, and a great many of them are very ￼￼similar to one another, so the subject was expanded to provide a comprehen- sive overview of all the cartilaginous fish. These animals are unique in that their skeletons are made of cartilage rather than bone. This subject expansion makes the poster more useful and provides far greater visual interest. All of these fish are members of the Chondrichthyes class, which includes the sharks, rays, skates, and chimaeras, sometimes called ghost sharks. They are presented within their various biological groups. Of course, the great white, hammerhead, whale shark, and other famous sharks are shown. This poster also includes a section on the Megalodon. This long-extinct shark was one of the largest and most powerful predators in vertebrate history. It was almost three times the length, and four times weight, of the Great White Shark, which terrorized audiences in Jaws.